Summer is officially here and it seems like everywhere you go, there are dogs enjoying the season with their owners. It makes us love the Madison area even more to see dogs hanging out at Memorial Union, or co-captaining boats on Lake Mendota. Some dogs love lounging in the sun, while others can’t wait to get back to their air-conditioned comfort zone. 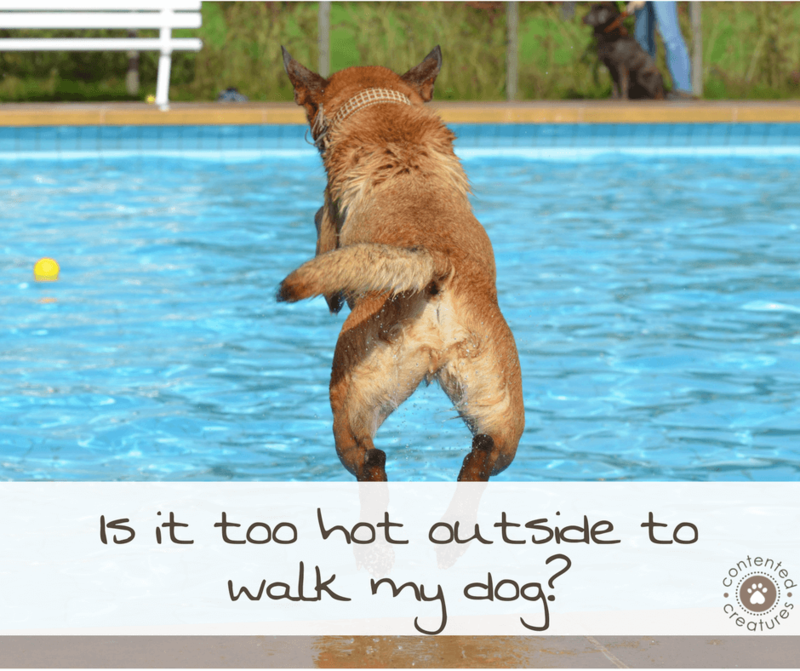 So how do you know when it’s too hot to walk your dog? We take your pet’s health and well-being seriously. Everyone on our staff is certified in Pet First Aid & CPR and trained to watch your dog for any sign of discomfort. We have specific guidelines we follow to keep all the dogs in our care comfortable. Is the pavement hot? Check by holding your bare hand or foot to the surface. If you can’t keep it there 10 seconds, it’s dangerous to walk your dog on it. What’s the temperature? What about the heat index? Wisconsinites are no stranger to humidity, and it can make it a lot more uncomfortable for your dog. Does the dog have a short nose or a thick coat? Bulldogs, Bostons, Pugs, and other similar breeds are prone to breathing problems and are less efficient at panting. Arctic breeds like Huskies, Malamutes, and Samoyeds struggle with the heat more than others. Ninety degrees may not seem that hot to you, but to dogs it can be unbearable. To keep our friends safe, it’s our policy to not strenuously walk dogs when it’s over 90 degrees, or when the heat index is over 90. At these levels heat stroke can occur quickly. Should your dog ever exhibit any of the above symptoms, it’s important to get him to the vet as soon as possible. Absolutely, we couldn’t agree more! After a little stroll and potty break, we usually go back indoors for some fun games. We have a lot of tricks up our sleeves to tucker your dog out mentally. Tug of war, hide and seek, and puzzle games are some of our favorites. No matter what your pets like to do, we are here to engage with them and provide stimulation while you’re away, even if the weather doesn’t cooperate. Keeping them safe and happy is our mission. Related: How to Keep Your Pets Entertained Indoors, What’s Our Policy on Walking Dogs in the Wisconsin Weather?